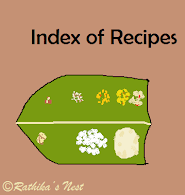 This is my 300th recipe on Rathika's Nest, and I wish to thank all my readers for your kind support without which this feat would not have been possible. Many thanks indeed! Millets are often used in traditional cooking to make breakfast items and rotis. I have tried using millet flour for baking and it has turned out well. Pearl millet (கம்பு) is rich in carbohydrate, protein, dietary fiber, vitamins mainly B complex and minerals especially phosphorus and potassium. Pearl millet flour is light brown in color and is available in most grocery stores. This snack, baked with pearl millet flour and peanuts is nutritive and tasty. Go on. Give it a try! Method: Sieve pearl millet flour, baking powder and cooking soda together 2-3 times. Add in salted butter. Blend the butter with flour mixture very well using your fingers in a bowl. Beat the curds well. Add in cinnamon powder and sugar. Mix well. Add the curds mixture little by little to flour mixture, while beating continuously with a hand blender or ladle. Once all the curd mixture is added, continue beating till the batter becomes smooth and creamy. Add roasted peanuts and mix well. Peal millet batter ready to bake! Grease a microwave safe glass bowl with butter. Transfer the batter to the greased bowl; gently shake the bowl so that the batter settles evenly. Preheat the microwave oven in convection mode at 200oC for 2 minutes. Now place the bowl containing the batter on the grill stand and bake in convection mode at 200oC for 10 minutes or till the crust turns golden brown. Switch off the oven. Remove the bowl from the oven and allow it to cool. Cut it into quarters and serve as a snack. This easy-to-make millet snack is quite filling.